"...I can't stop raving about it." "GeekDesk makes an extremely popular platform that makes your desk go up and down at a push of a button." "All our team members have the option to work on a GeekDesk®." "Quality certainly wasn't suffering with the price." "The GeekDesk Max is a solid piece of furniture that will handle the toughest studio, gaming, or work setups." 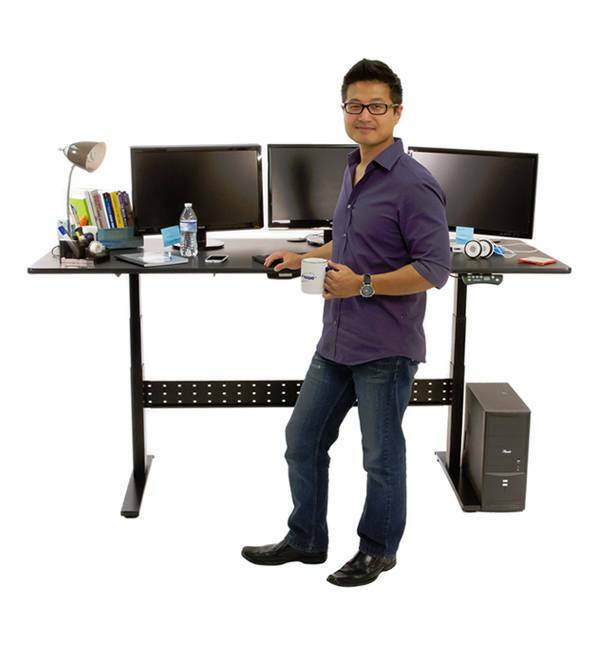 GeekDesk® provides high-quality adjustable-height standing desks. With the simple click of a button you can change the height of your desk from sitting to standing which improves your health and productivity while you're working. Serving office workers, corporate professionals, creative professionals, and businesses of all sizes...we help you ease and prevent pain, stay healthy and live longer. Desks matter, because what people do at their desks matter. Our customers are smart, talented people who do amazing work every day. We have the privilege of serving them by providing high-quality, affordable standing desks that supports their work, day in and day out. We strive to do this in innovative ways, with thoughtfully designed, high-quality products, and a heart to serve people going above and beyond expectations to deliver a superior product and experience. We aim to change the way people think about the furniture and accessories that support their work, and thus enhance their professional and personal lives. Did you know that we spend close to 90% of our days sitting down? That is some figure when you consider that our bodies are naturally built in a standing state. We are made to move. We are made to stand. GeekDesk® was Inspired from a need to reduce back pain. Stuck at a desk sitting down all day made us unhealthy, made us unhappy and unproductive. But most of all it put us in pain. So we wanted to make a solution to make ourselves healthier and to make you healthier. In 2008 we founded GeekDesk® which ultimately paved the way for the adjustable height standing desk market. So, if you're reading this while you're sitting down, you might want to stand up (especially if you have back pain.) But, back pain isn't the only health concern using a standing desk prevents. The benefits of a standing desk don't stop at the physical. Naturally, sitting down slows your body down. Compressing and putting stress on your spine, muscles and joints reduces blood flow, it makes you fatigued and uncomfortable which is then reflected in your mental state. Standing up kick starts your body in motion and increases your blood flow which in turn increases your energy. This allows you to become more focused, more productive and work smarter. This improved work state means you are set up to deliver the very best work at your desk, leaving you fulfilled, satisfied, and healthy! We pride ourselves on the quality craftsmanship and the robust features that have given GeekDesk® the trusted reputation that has shaped the standing desk market. Three section legs allow the GeekDesk® to extend across a greater range of heights than the two-section legs of many competing desks. Our solid steel frame specially reinforced for stability at any height makes the desk highly robust. While our crossbar provides the rigidity for your desk, making it feel solid on every level and high in quality. Is this health and productivity hack too good to be true? Try us out and see for yourself. Experience the benefits of our desks in your office or at home and if you are not happy with it simply return it to us. You, our customers are our inspiration and our driver, we want to serve you so you can do your best work and maintain your best health. If you have questions about which Desk is best for you or just want to speak to one of our support Geeks, simply contact us here to feel the love. You'll be the first to hear about new arrivals, the latest in standing desk accessories and benefits of adjusting between sitting and standing throughout the day when you signup for our quarterly newsletter. Show us your GeekDesk® on Twitter or Facebook - we love seeing them in the wild!